Send parcels door to door for low flat-rates, across Australia and around the world. Take the guess work out of delivery costs, with Sendle's low flat prices. Why post when you can Sendle? 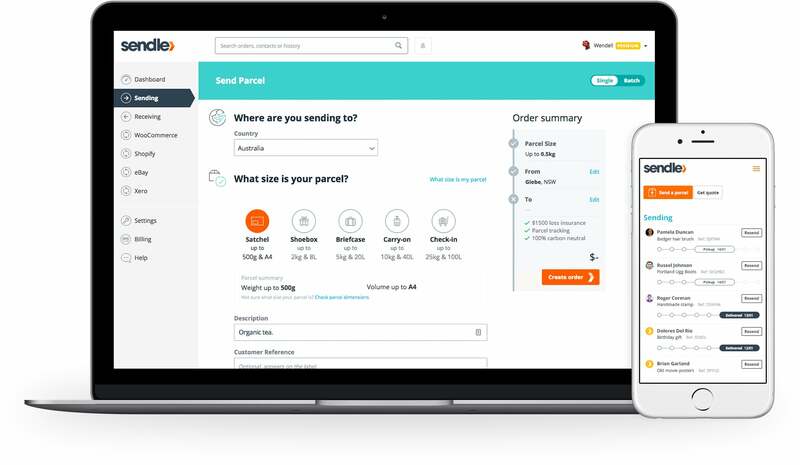 Quote, book and track your parcels on any device, from your Sendle Dashboard. Spend more time on the fun stuff – we pick up your parcels and deliver to your customers around Australia. Everything you need in one place – book in seconds, manage deliveries and keep customers in the loop. Get easy access to detailed advice and support, powered by real people who are always happy to help. Free integrations and easy connection with other leaders in eCommerce. In general, same-city deliveries arrive overnight and deliveries to nearby cities within 2-3 days. Though very speedy, Sendle does not currently offer an express or guaranteed overnight delivery service. Sign up to send and save instantly. Save money, save time, take control of your deliveries. How many parcels do you send per month? Get my free account Sign up now!